They're members of our families who are in our lives for years. They love us and cheer us up when we're down. They snuggle with us, and make us laugh. They adopt us just like we adopt them. They're our beloved pets. 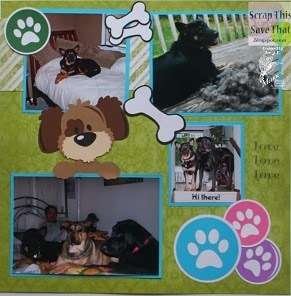 And today, my scrapbook layout is dedicated to them! 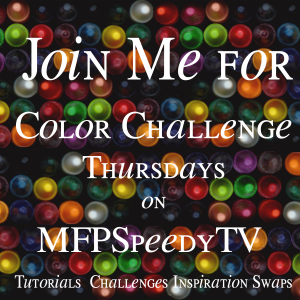 Today is our day to start a new Color Challenge over at the MFP Speedy TV Ning site. This week, the challenge is to use bright colors. Piece of cake for me!!! I use bright colors all the time! 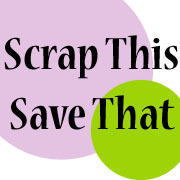 We would love to see you link your brightly colored projects up with us this week. 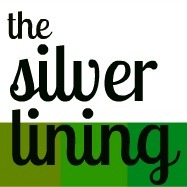 The linky will stay open until next Wednesday at 6 PM PST. I started out looking in the Silhouette Store for some inspiration. 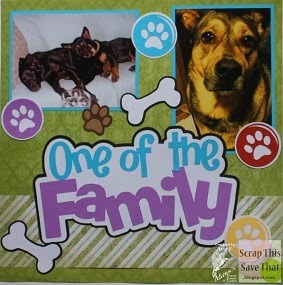 I found an adorable cut file from Paper Piecings by Nikki that was a layout designed especially for dogs. Since we have a family of pups, and tons of pictures, I chose this file for my pages. 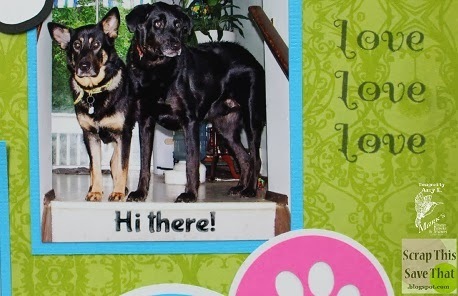 One of the dogs in the layout (the brown one) passed on last year but he was a member of the family for so long, I still wanted to include him on the page. So, yes, we had three gigantic dogs at one time. You should have seen our dog food bill! Each one of the two dogs we still have left, belong to our kids, but somehow when they moved out the dogs stayed! I chose to do the majority of my layout in just plain bright card stock. 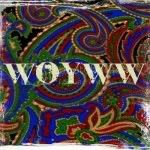 I did, however, use two sheets of patterned card stock from DCWV. All of the embellishments on the page were part of the PPBN cut file. The stamp sets I chose to use on this layout are both new releases this month from Mark's Finest Papers. The word "love" is from the Swans stamp set. I just stamped the word three times to make a nice square shaped embellished area. The phrase "hi there" is from the mini set that you will get free this month when you purchase the four other new release sets. I used Memento ink in tuxedo black to stamp the sentiment directly onto my photograph. As long as you have a very steady hand and give it plenty of time to dry, this usually works pretty well. Do you have any beloved family pets? Tell me about them!